Grand Master Masao Hayashima was born as a son of Otakasa family, the founder of Kochi Castle. Otakasa family, closely related to Murakami Genji inherited Aiki-jujutsu (Aikido) and Doin from Genji marine force. Under the agreement between families, he was adopted by Hayashima family and grown up to become a master of Taoism. After his long dedicated training, he became the 13th head of the Lung Men (Dragon Gate) school of Taoism in Taiwan as the first non-Chinese. At the same time, he became advisor to the Szu Han T'ien Shih Fu (office of the celestial master who aided the Han Dynasty). 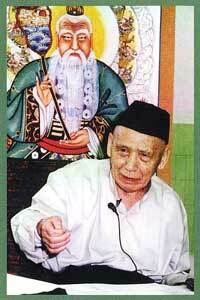 In 1991, he attended International study committee of Ch'uan-chen (Complete Perfection) School of Taoism in China. He was the only Taoism disciplinant invited from Japan. Myozui Hayashima, his wife, accompanied him and they were welcome enthusiastically by Chinese people. The books Grand Master Hayashima wrote counted over 80, give us explanations about Taoism in plain form. Even after his departure to Senkyo, Taoists' heaven, his books continue to be reprinted and read in and out of Japan. Grand Master Myozui assumed Docho, and became the 14th head of the Lung Men (Dragon Gate) school of Taoism. She provides ki trainings (Doin-jutsu, Doko-jutsu, Senshin-jutsu) of Taoism for mind and body all around Japan.